The GL Floor Finishing Company was originally established in 1965. Now in our 50th Year we have grown to become one of the foremost installers of Hardwood flooring opperating in Britain today. Our time served craftsman are all fully employed (No Subbies) and are a testament to the the companies commitment to training and traditional apprenticeship. We undertake all aspects of hardwood flooring from Ornate parquet designs to Fully sprung dance floors. 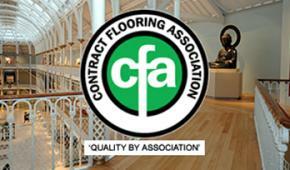 Our Commercial expertise stems from our many years experience in the field of Hardwood flooring. We prepare thoroughly. We train Riggerously. We attend to detail pedantically but above all else WE CARE. The objectives of the CFA are to promote the highest standards of professionalism, safety and training. The GL Floor finishing Company of Edinburgh started trading in April 1965 operating from a small basement shop in Forth Street. The Company quickly established it's reputation for high quality Hardwood flooring and Specialist wood floor renovation. We source our flooring from reputable manufacturers who understand the crucial importance of ethical sourcing policy.